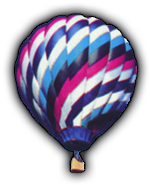 Have Balloon Will Travel is located in Harmony Township, north of Phillipsburg, N.J. and is readily accessible from both Routes 78 and 80. It is within an hours drive from NYC. Our flights take us over the farmlands of Warren and Hunterdon Counties and also over the Delaware River into Eastern Pennsylvania. Interstate 80W to exit 12 (Hope/Blairstown), make a left heading south on Rt. 519 South into Hope (1.2 miles to four way blinker in town), go 7.5 miles to Route 46 intersection, go 9.3 miles to 4-way blinker at BrassCastle Road, go 10.9 miles to stop sign, turn left (continue on Rt. 519 South), go 16.8 miles to the Citgo (Harmony Hardware), 17.2 to Harmony spirits/deli/grocery, stay straight onto 646 South, (17.8 miles), turn right onto Old Belvidere Road, third driveway on right. Take Exit 3 (Phillipsburg/Alpha), continue on Rt. 22 West to the third traffic light, make a right turn onto Rt. 519 North, go approximately 4 miles across the Rt. 57 intersection until you come to a stop sign at a "T", make a left onto Rt. 646 South, Go 4/10's of a mile and turn right onto Old Belvidere Road, at the first driveway past the brick ranch, turn right.